… from our little part of this galaxy, not that long ago. Forty-five years ago today — May 4, 1967 — an Atlas Agena rocket launched from Cape Canaveral carrying the Lunar Orbiter 4 on its mission to the Moon. Lunar Orbiter 4 developed problems with the camera door, however: it did not open and close correctly when commanded, and mission controllers feared that it might stick closed so they commanded it to remain open. This required extra attitude control manuevers on each orbit to prevent light leakage into the camera which would ruin the film. On 13 May it was discovered that light leakage was damaging some of the film, and the door was tested and partially closed. Some fogging of the lens was then suspected due to condensation resulting from the lower temperatures. Changes in the attitude raised the temperature of the camera and generally eliminated the fogging. Continuing problems with the readout drive mechanism starting and stopping beginning on 20 May resulted in a decision to terminate the photographic portion of the mission on 26 May. Just a decade ago, on this date in 2002, the remote sensing spacecraft Aqua was launched from Vandenberg AFB by a Delta-II rocket. for the large amount of information that the mission is collecting about the Earth’s water cycle, including evaporation from the oceans, water vapor in the atmosphere, clouds, precipitation, soil moisture, sea ice, land ice, and snow cover on the land and ice. Additional variables also being measured by Aqua include radiative energy fluxes, aerosols, vegetation cover on the land, phytoplankton and dissolved organic matter in the oceans, and air, land, and water temperatures. If I recall, one of the folks I worked with at the Defense Technology Security Administration came to us from the Aqua program. Pretty cool. 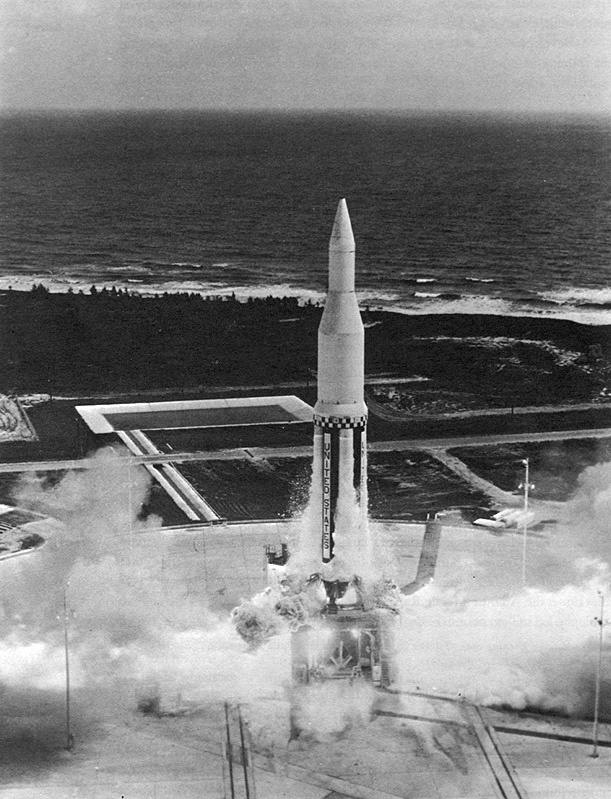 Forty-five years ago today — April 17, 1967 — an Atlas-Centaur rocket launched from Cape Canaveral, sending Surveyor-3 on its way to the Moon. Surveyor-3 landed on the Moon on April 19th, the second of the Surveyor series to make a soft landing. Its other objectives were to transmit television images of the lunar surface, use its sampler to probe the surface materials, and test the surface’s load-bearing strength and other properties in advance of the Apollo missions. 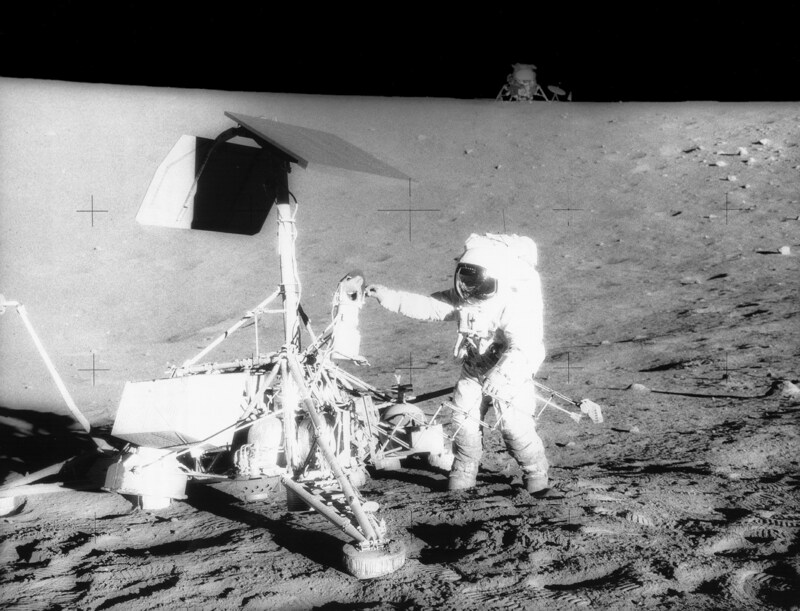 In what I think of as a fulfillment of Surveyor-3’s destiny, two and a half years later — on November 19, 1969 — Apollo-12 landed within about 600 feet (180 meters) of Surveyor-3. As shown in the image above, astronauts Pete Conrad and Alan Bean visited the spacecraft and examined it closely. They retrieved several parts, including the television camera, and returned them to Earth for analysis. Surveyor-3’s camera was put on display in the National Air and Space Museum. Forty years ago today — April 16, 1972 — astronauts John W. Young, Jr., Thomas K. Mattingly, and Charles M. Duke, Jr., blasted off from the Kennedy Space Center atop a Saturn-V booster, on their way to the Moon. Apollo-16 was the fifth mission to land on the Moon, and the second in which astronauts drove the Lunar Rover to explore a wide area around their landing site. Young and Duke spent almost three days on the lunar surface, and made three separate excursions from the Lunar Module out onto the Descartes Highlands. And for bonus “aerospace” history, on this date 145 years ago Wilbur Wright was born in Millville, Indiana. I find it interesting how quickly we went from Wilbur and Orville’s first powered flight at Kitty Hawk to landing on the Moon — and I wonder when it will become important to us to push outward from there. Some space history moments we might rather forget … but in some ways they’re more important to remember. Like this one. Forty-five years ago today — January 27, 1967 — the Apollo-1 capsule caught fire during an on-pad test, killing astronauts Virgil I. 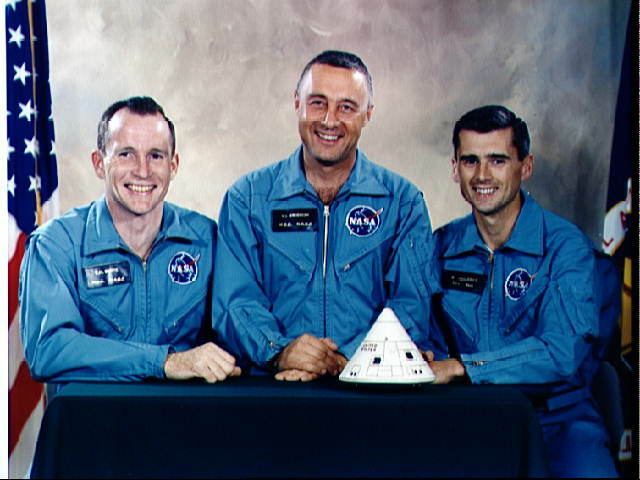 “Gus” Grissom, Edward H. White II, and Roger B. Chaffee. To verify overall spacecraft/launch vehicle compatibility and demonstrate proper function of spacecraft systems with all umbilicals and Ground Support Equipment disconnected. To verify no electrical interference at the time of umbilical disconnect. To verify astronaut emergency egress procedures (unaided egress) at the conclusion of the test. Unfortunately, few if any of the operators and engineers had considered how hazardous the Plugs-Out test conditions would turn out to be. The most probable initiator was an electrical arc in the sector between -Y and +Z spacecraft axes. The exact location best fitting the total available information is near the floor in the lower forward section of the left-hand equipment bay where Environmental Control System (ECS) instrumentation power wiring leads into the area between the Environmental Control Unit (ECU) and the oxygen panel. Components of the Environmental Control System installed in Command Module 012 had a history of many removals and of technical difficulties including regulator failures, line failures and Environmental Control Unit failures. The design and installation features of the Environmental Control Unit makes removal or repair difficult. Coolant leakage at solder joints has been a chronic problem. The coolant is both corrosive and combustible. Deficiencies in design, manufacture, installation, rework and quality control existed in the electrical wiring. No vibration test was made of a complete flight-configured spacecraft. Spacecraft design and operating procedures currently require the disconnecting of electrical connections while powered. No design features for fire protection were incorporated. The investigation into the accident led to many significant improvements in the vehicle design, as well as better test and flight procedures that made the ensuing Apollo missions much safer. It’s unfortunate that the cost of those lessons was so high, but that seems to be the case with many of the important lessons we learn. I suppose most Iowans who are disappointed with the field of potential Republican candidates — and let’s face it, the field as a whole has been pretty disappointing for the last several months — will just stay away from the caucuses, but here’s an alternative for the more daring: show up and support the Anti-Candidate! As always, I’m available as your convenient throwaway write-in vote for any office, anywhere. I don’t make any promises, not even to show up for the job … that way I won’t be as much of a disappointment as your run-of-the-mill politicians. And what other candidate offers you occasional space history items? None, I tell you! Speaking of which: a half-century ago today — January 3, 1962 — NASA announced that its two-manned vehicle program, a major precursor to the eventual Apollo missions to the Moon, would be named “Gemini.” Up until that point it had been called Mercury Mark II, and NASA considered other names such as “Diana,” “Valiant,” and “Orpheus.” But Gemini it became. For more on the names of NASA’s early missions, check out the “Origins of NASA Names”. 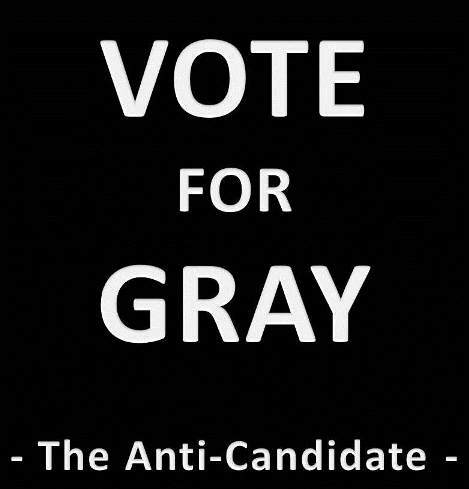 I’m the Anti-Candidate, and I approved this space history post. Fifty years ago today — November 28, 1961 — North American Aviation won the prime contract to develop the Apollo Command & Service Module. The prime spacecraft contractor would develop and build the command module, service propulsion module, adapter (to fit the spacecraft to a space laboratory for earth-orbital flights and to the lunar landing propulsion section for lunar missions), and ground support equipment. The Martin Company actually had the highest aggregate rating from the source evaluation board, but North American Aviation had scored highest in technical qualifications and had “the longest record of close association with NACA-NASA and the most straightforward advance into space flight.” That apparently won the day for them, although Martin employees had been told — erroneously, as it turned out — on the 27th that they had won the contract. Forty-five years ago today — November 11, 1966 — Gemini XII launched from Cape Canaveral atop a Titan-II rocket. 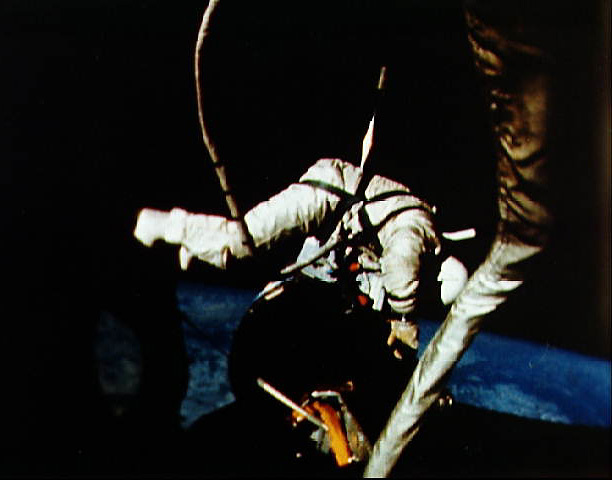 Gemini-12 astronauts James A. Lovell, Jr. and Edwin E. “Buzz” Aldrin, Jr., spent 4 busy days in space, completing three extra-vehicular activities (EVA) — including one full-up “spacewalk” — as well as docking with a target vehicle, an Agena that was launched less than 2 hours earlier. During one of the spacecraft’s orbits on November 12th, the crew were able to take pictures of a total eclipse that was visible in the Southern Hemisphere. With the completion of the Gemini program, the U.S. space program turned its full attention to Apollo and the Moon. Fifty years ago today — October 27, 1961 — Saturn-I launched from Cape Canaveral. 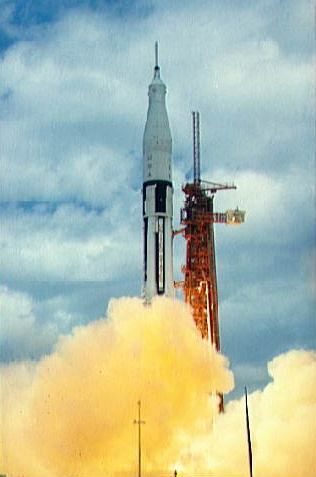 This launch was, as the title stated, the first test flight of the Saturn family of rockets that were intended to propel the Apollo astronauts to the Moon. Oh, to have been a part of that program! But at least I have a small collection of Saturn-related relics I salvaged during my time at the Rocket Lab. Forty-five years ago today — August 25, 1966 — NASA launched another suborbital Apollo-Saturn vehicle to test Command & Service Module systems in advance of manned Apollo launches. AS-202‘s flight objectives were to verify the Saturn 1B launch vehicle’s integrity, loads, and performance, and to evaluate the separation system, emergency detection, and heatshield of the Apollo spacecraft. On this date in 1971, NASA pilot William “Bill” Dana made the first supersonic flight in the M2-F3 lifting body. Last November, I blogged about Dana making the first flight in the M2-F3. I likely will continue posting occasional references to Dana’s flights, because he’s one of the most interesting people I ever met (during my first USAF assignment, we were both on the Flight Readiness Review Committee for the very first launch of the Pegasus system). If you want to know more about him, check out his Wikipedia page. Forty-five years ago today — August 10, 1966 — Lunar Orbiter 1 was launched atop an Atlas Agena rocket out of Cape Canaveral. The spacecraft experienced a temporary failure of the Canopus star tracker (probably due to stray sunlight) and overheating during its cruise to the Moon. 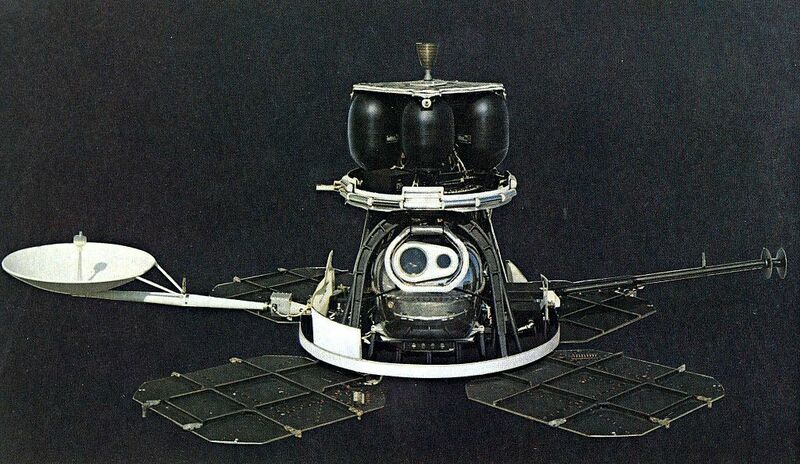 The star tracker problem was resolved by navigating using the Moon as a reference and the overheating was abated by orienting the spacecraft 36 degrees off-Sun to lower the temperature. Although some of the first orbiter’s photographs were smeared, the mission was an overall success, including taking the first two images of the Earth from the vicinity of the moon. And on this date 10 years ago, the Space Shuttle Discovery launched from the Kennedy Space Center on mission STS-105. Astronauts Scott J. Horowitz, Frederick “Rick” W. Sturckow, Daniel T. Barry, and Patrick G. Forrester transported 7,000 pounds of supplies and equipment to the International Space Station. They also ferried the ISS Expedition 3 crew — Frank L. Culbertson, Jr. (see below), Vladimir N. Dezhurov, and Mikhail Tyurin — to the station and returned the Expedition 2 crew — Yury V. Usachev, James S. Voss, and Susan J. Helms — to Earth. Eight years after his return to earth, I sat next to Captain (USN, Retired) Culbertson at the NASA Industry-Education Forum in Washington, DC. He was a very nice fellow, despite having graduated from a rival high school down in Charleston. Many years ago I gave up my dream of being an astronaut (I’d already worked Shuttle landings at Edwards AFB, but failed to be accepted as a Flight Test Engineer candidate), but it’s cool to have met and worked for some. 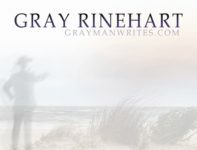 Thankfully, I can still take imaginary voyages through my own and others’ fiction.